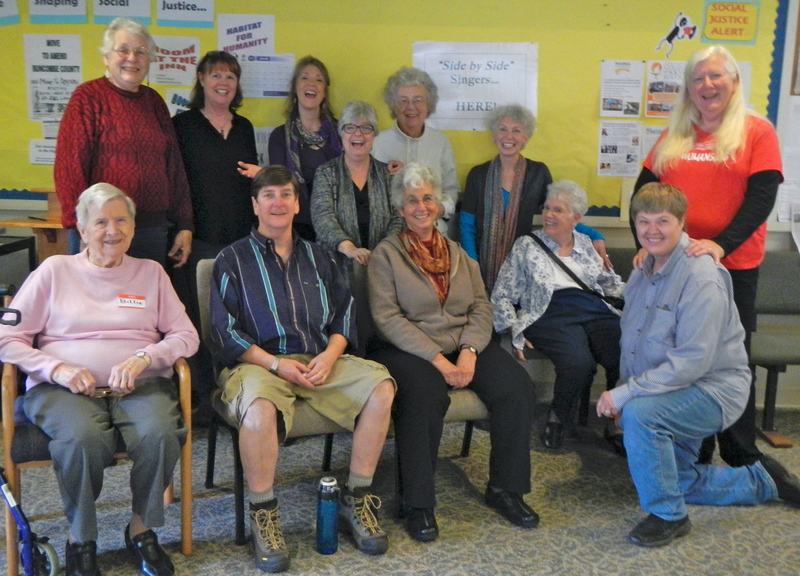 We are happy to say Side by Side Singing will be starting again on Wednesday, April 2, 2014. Thanks to the support of the North Carolina Center for Health and Wellness we will be offering six weeks of sessions from 1 – 2:30pm each Wednesday from April 2 until May 7 in the Sherrill Center at the University of North Carolina Asheville. people who have mild to moderate cognitive impairment such as dementia, Alzheimer’s or brain damage and their care-partners. These sessions are designed to enhance the quality of life for those with memory loss and reduce the stigma associated with it — through the communal experience of creating beautiful music in the present moment. For more information about parking, finding the specific room we will be singing in (“How to Find Us”) health benefits of singing, and links to other similar groups around the world — there are pages on this blog devoted to those topics. There is even a page titled “About the Sessions” which will tell you exactly what you can expect the first time you attend a Side by Side session. We hope you will come sing with us — side by side!